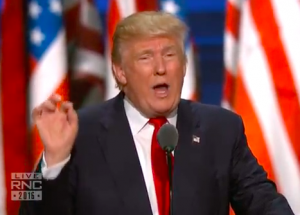 Donald Trump speaking at the RNC. A consistent theme of Donald Trump’s campaign speech at the Republican National Convention on Thursday night was rising crime. But his message doesn’t align with crime data, which shows a gradual decline for more than two decades. So how does his campaign explain the “law and order” message? Trump’s campaign manager, Paul Manafort, claims the FBI’s annual data on crime isn’t reliable. “The FBI certainly is suspect these days for what they just did with Hillary Clinton,” Manafort told CNN. Manafort provided no evidence that the numbers were wrong. Posted: 7/22/16 at 9:46 AM under News Story.